Although this is a young wine, all the flavors and aromas have already melded together in harmony. It’s a full-throttle California Chardonnay, exhibiting rich nose impressions of smoke, toast, spice and butter, all wrapped around light scents of nectarine, sweet lime, and tropical fruit. Despite its bigness, this white shows a refinement more associated with Old World Burgundies. It is delicious on its own, but would also be a marvelous foil for a seafood pasta with Alfredo sauce. The Santa Lucia Highlands appellation, on the east-facing side of the mountain range in Monterey County, has developed a reputation for being a world-class region for Burgundian varietals. This wine is a translucent dark coral/ruby color, hinting at the concentration and extraction in this bottling. Fresh berry scents are upfront in the nose, leading to darker cherry cola and chocolate impressions, followed by a kiss of clove. It is light, boisterous, and juicy in the mouth, showing an elegant, silky texture. At the end, some earthy, youthful grip pops up. One of the most common mistakes people make when tasting wine is to confuse the fruitiness of a wine with sweetness. Sweetness in wine means only one thing; the amount of sugar left in the juice after the fermentation stops. It is referred to as residual sugar or R.S. When tasting wine, your tongue really can only taste sweet (sugar), sour (acids) and bitter (tannins). Fruitiness is the tendency of wine to taste and smell of fruit. When the fruit is sweet, like cherries or plums, tasters often mistake the fruitiness for sweetness. The easiest way to tell if a wine is sweet or fruity is to eliminate the sense of smell. Fruit flavors are mostly aromatic, in other words you smell them much more than you taste them. Sugar is felt on the tip of the tongue. So if you smell a wine and it smells sweet and you taste a wine and it tastes sweet, pinch your nose and taste it again. A sweet wine will still taste sweet while a dry fruity wine’s sweet characteristics will be gone. Confused? OK, let me simplify. Pinch your nose and taste. Is it sweet? Then it’s a sweet wine with R.S. Pinch again, if you don’t taste sweet, then it’s a dry wine and what you thought was sweet was just that fruit thing messing with your mind. The Rio Grill in the Crossroads Shopping Center in Carmel has been one of our favorite restaurants for many years. Great food (killer onion rings) and half-priced wines on Mondays have kept us going back. In 2007 Taste Morgan opened, featuring a large, comfortable tasting room with a friendly staff. Turlock native and owner, Dan Lee, features excellent wines from the Santa Lucia Highlands and Morgan’s own organically farmed Double L Vineyard. This year, two other tasting rooms have moved into the center. Southern Latitudes Wines sells exclusively the wines of Australia, New Zealand, South Africa, Argentina and Chile. If you’re not familiar with these wines this is the place you want to visit. They have daily tastings and can turn you on to some very interesting wines. 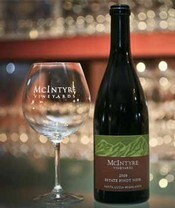 The third tasting room, soon to open, is McIntyre Vineyards. 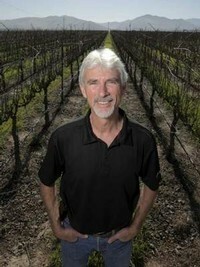 Owner Steve McIntyre produces some of the best Santa Lucia Highlands chardonnay and pinot noir in the region. The McIntyre site is just across the street from Taste Morgan and a few hundred feet from Southern Latitudes Wines. Three wines, all under $12, graced our table this week; the 2013 Hanna Sauvignon Blanc, the 2012 McManis Syrah and the 2012 McManis Jamie Lynn Vineyards Barbera. We’d like to invite them back again. Cheers! Thanks to Mike Hale, The Grub Hunter for the Herald, the Hyatt Highlands Winemakers dinner series featuring McIntyre Vineyards has taken a front row seat in the news! Click here for the link to the full online article to read on the bites and wine offered. Grab your tickets promptly or call 831-622-5445 to make a reservation as the dinner takes place Thursday, January 16th inside the Hyatt Carmel Highlands wine room. The tickets can be purchased here. 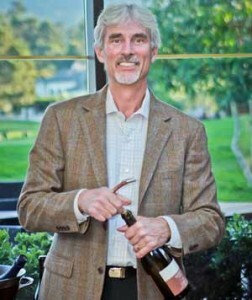 This is a great opportunity to meet Steve McIntyre, awarded the 2013 Grower of the Year by the California Association of Winegrape Growers, his family and friends while eating a delicious menu created by Chef Matt Bolton. Start your 2014 year by completing a spectacular item off your bucket list or fulfill a New Years resolution with the ones you adore. "It is hard to imagine a more prestigious or beautiful place to hold a winemaker dinner in Monterey. Between the food, the view and the wine the evening should be spectacular," McIntyre said.